Zach Braff (Scrubs) stars as Tom Reilly who has recently discovered that his new wife Sofia and him are about to have a baby. Although Sofia (Amanda Peet) was the bred winner of the family, Tom has never been able to find his footing in the workplace and when he gets fired as Chef, Tom and Sofia must return to her childhood home in order for Tom to get a job with his father. To compound the situation for Tom, he meets Chip (Jason Bateman) who is the ex of Sofia and has never gotten over her. Chip is also wheelchair bound and when a war starts between the two, things go from bad to hilarious in this predictable romantic comedy. 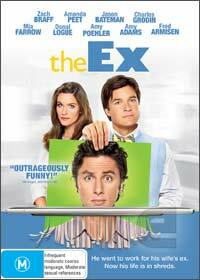 Zach Braff plays his standard loveable "dork" that may not make this the most memorable movie but will still bring a few laughs for a great night in. Featuring some interesting Alternative endings and deleted scenes, these will bring a few more laughs for those that enjoyed the main film.